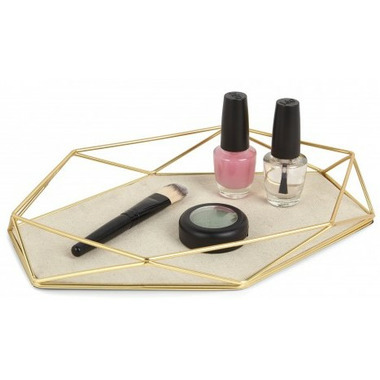 This Umbra Prisma Jewelry Tray is brass plated with linen lining. I'm very happy with this jewelry tray. I purchased it to keep my watch in to avoid scratches. The quality is very good and the item looks stylish. I added a few miniature perfume bottles and this little tray is a great decorative addition to my bedroom. I already own this adorable little tray and a friend of mine has been admiring it ever since I got it, so I decided to get one for her. She just loves it!!! Thank you Umbra for this stylish, yet affordable piece. This adorable little accent is exactly what my nightstand needed. Very happy with my purchase. Quality is great. Happy to support a Canadian company.